Southern Tier, despite what you might think, aren’t a brewing company located in the South. They’re out of Lakewood, New York, and started brewing beer in 2002. They’ve grown a lot since the beginning, and are now distributed in about half of the United States and several foreign countries. 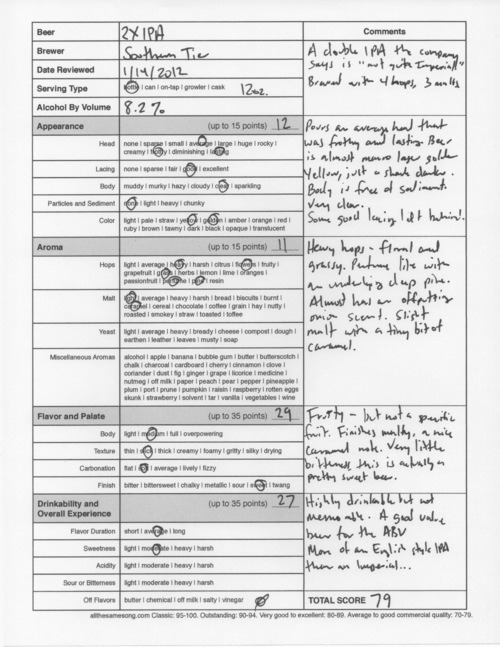 I recently reviewed Southern Tier’s IPA, and scored it 93 points. It’s a well balanced IPA with nice flavors, so I thought it would be worth trying their Double IPA, since the regular IPA got such high marks. 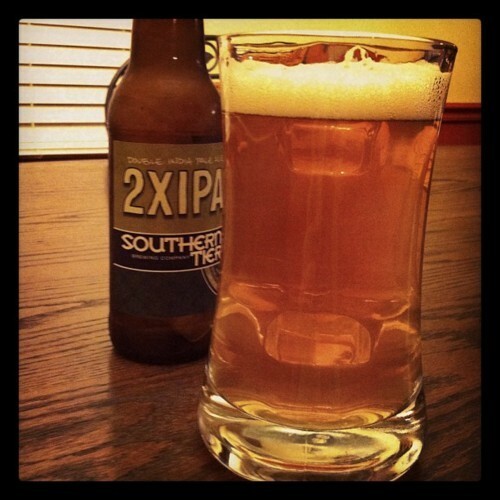 Southern Tier calls their Double IPA 2XIPA, and they say it’s not quite a Double, but it is not a standard IPA, either. On the bottle for their regular IPA, it says the beer is brewed with four varieties of hops, and four varieties of malt. 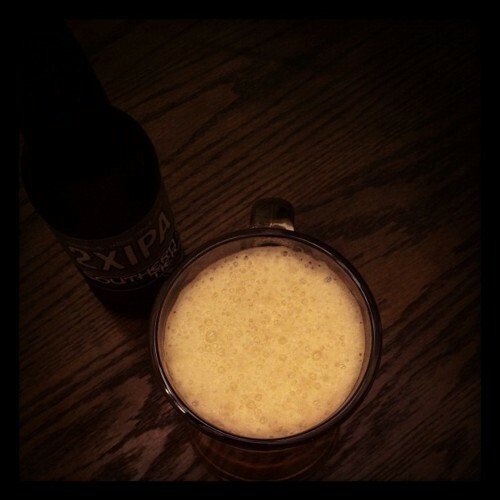 The 2XIPA keeps the four different hops, but sacrifices one malt. As far as not being a real Double IPA, the alcohol by volume (ABV) certainly qualifies: this beer comes in at 8.2%. The pour produced an average size head, frothy and lasting. The beer was just a shade darker than macro lager golden yellow. The body was clear and there were no particles or sediment to be found. Lacing was good with some large initial bits left on the glass. In the aromatics, there’s heavy hops, floral and grassy. The overall hop aroma is very perfume-like, with an underlying deep scent of pine. But lingering in the background is an almost offensive aroma of strong onion. It doesn’t break the whole aromatic picture, but it does pull away from its overall beauty. There is some maltiness as well, but it’s only slight with a hint of caramel. The taste of the beer is fruity, but it’s hard to pinpoint a specific fruit. The general fruitiness is sweet and transitions into a malty finish, with a solid caramel flavor. Although a Double IPA, this one has only a tiny amount of bitterness, which is found in the middle of the taste. The mouthfeel is slick and a little creamy. 2XIPA has a high drinkability, but this is definitely not your typical Double IPA; this one drinks more like an English style IPA. If you’re expecting a crush of hops, you will be disappointed. And despite the easy drinking quality, this beer isn’t very memorable. This beer is a remarkable value — at $8.99 for a six pack, and the 8.2% ABV, if you want to get there fast and have a decent tasting drink, this might be your ticket. But if you are in it for the enjoyment and looking for a flavor bomb, this is not your beer. 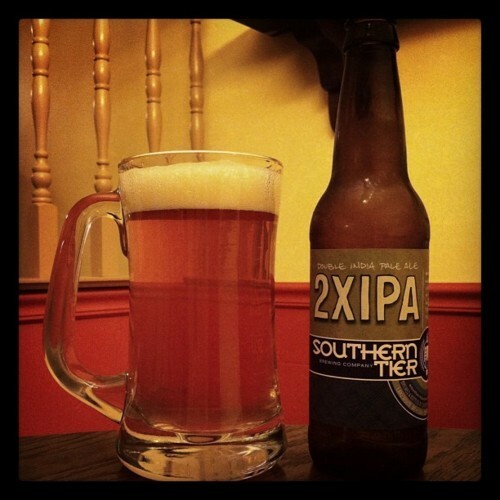 Southern Tier 2XIPA, 79 points. Price: $1.79 US for one twelve ounce bottle.